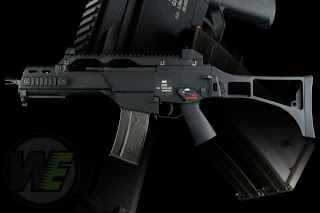 Pyramyd Airsoft Blog: Review of the WE G39C? Review of the WE G39C? I need some feedback on whether you readers out there would be interested in having me review the WE G39C here on the Pyramyd Airsoft Blog. Post up in the comments section if you're interested. If there's enough interest, I'll see about getting a hold of one and putting the review up here for all y'all's enjoyment. Lemme know, fa sho. Word.